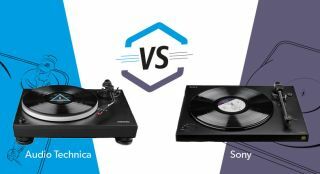 Audio Technica AT-LP5 vs Sony PS-HX500: which is the best USB turntable? | What Hi-Fi? Audio Technica AT-LP5 vs Sony PS-HX500: which is the best USB turntable? In 2017, the term ‘Vinyl revival’ seems almost archaic. But while it was written off by many as merely a fad – and if the past year has taught us anything, it’s the danger of complacency in the face of a popular uprising – we appear to be very much in the midst of the second coming of 33 1/3. But the 12-inch wasn’t brought back from the dead for its convenience. An afternoon vinyl session still requires you to get up from your seat more often than in a game of musical chairs. And you have to be in the same room as your turntable to enjoy it. There’s no way round that – or is there? What if vinyl could be pocketable? We aren’t talking about a portable turntable – even the burden of a personal CD player would be too much these days – but rather one that can rip your records to digital files so you can carry them around in your pocket on your smartphone or portable music player. This is by no means a new phenomenon, but so plentiful and talented have USB turntables become they commanded their own category at the 2016 What Hi-Fi? Awards. Victorious by a small margin back then was Audio Technica’s AT-LP5. However, Sony’s contender has since dropped a weight division by shedding £150 from its price. It seems only fair to offer the PS-HX500 another spin in the ring. There’s an immediate difference between the two that becomes apparent when they're unpacked Sony – the Hi-Res Audio logo on the front-facing edge of the Sony's plinth. The PS-HX500 can convert vinyl into DSD 5.6 files so, while that doesn’t necessarily mean ripped records will bear comparison with files downloaded in the same format, in theory you’ll hear a more faithful rendering of this turntable’s capability. Other than its hi-res rosette and a speed-switching dial, the Sony’s plinth is largely undecorated. It hasn’t followed in the fashionable footsteps of the company’s colourful Walkmans, instead taking the minimalist approach of rival decks around this price. It's an understated rectangle. Sony is also proud of its one-piece tone-arm with integrated headshell, claiming that locating the stylus point in the centre of its axis and limiting rotational movement produces a more precise, stable trace. Tactility has always been a highlight when dealing with Audio Technica products. It isn’t necessarily build quality we’ve praised, at least not in the sense of it being well-manufactured or especially robust. It is about how the company's products feel to use. Here it's in the feel of the dial to switch between rotation speeds, the weight of the tone-arm and how it glides from its rest to vinyl. Before laying that first record on its rubber compound-crowned die-cast aluminium platter, we are expectant. Not to be outdone by Sony’s own innovation in the field, the AT-LP5 sports a J-shaped tone-arm that harks back to those used by Audio Technica in the 1960s and 70s. More than a retro design quirk, the company says it is engineered to minimise tracking error. It’s tipped with an exclusive AT95EX cartridge for claimed perfect balance. Of course, there’s little advantage to ripping your vinyl, hi-res or otherwise, if sound quality is poor. So we start with our current Award-winner, the AT-LP5. And we kick off by utilising its integrated phono stage. We begin by taking Nils Frahm’s live album Spaces from its sleeve. The first track on this record is An Aborted Beginning but, just one-and-a-half minutes in, we know we aren’t going to be disappointed. There is a great sense of the setting of the recording, a combination of spacious soundstage and detail as the natural room reverb is exposed. Further hints as to that amount of detail are present in the ringing synthesized notes and, though there are more rumbling lows than this turntable is able to produce, there is a really nicely poised, natural balance to the sound that doesn’t want for bass. Says, the first proper track after the record’s false start, then demonstrates the AT-LP5’s fine understanding of rhythm. Not only does that hypnotically bubbling synthesizer pattern time well, its rhythmic and dynamic emphasis allows the piece to grow rather than stagnate. It is an arrangement utterly dependent on anticipation of its climax, a task for which the Audio Technica here is more than ready. A similar thing could also be said of the following track, Said and Done, for the opening minute of which Frahm plays triplets of the same piano key. The AT-LP5 is dynamically versatile enough to express the intensity of each note, allowing the simple patterns movement rather than mere relentlessness. Switching to an external phono stage unarguably improves each aspect of the presentation, the sound opening up and allowing for even more detail to be extracted from those grooves. Yet it is the AT-LP5’s overall character we enjoy so much, something that is unchanging whether using its built-in phono stage or running through a more expensive alternative. An phono stage upgrade brings improvements, but it is far from a necessity to enjoy such a talented player. For the Sony’s riposte we place Dire Straits’ Brothers In Arms on the platter, and there’s no mistaking this turntable’s own penchant for detail as the synthesized flute and African-influenced drums in Ride Across The River come through with clarity and texture. The PS-HX500 is similarly articulate with the track’s offbeat rhythmic pattern, tying the multiple strands together for a coherent and layered delivery. It has the dynamic dexterity to bring even mild sonic shifts to our attention. The sprightly Sony is quick out of the blocks, too, springing into action with the upbeat opening of One World. It thrusts the drumbeat forward and, with a real sense of gusto and agility, puts its foot through the melodic guitar riffs that cut through the track. It’s with the more sanguine tunes that the PS-HX500’s slight tonal inclination towards the light side of neutral reveals itself, the presentation favouring a crisp consistency over the full-bodied solidity of the AT-LP5. It isn’t something worrying enough to penalise the Sony for, but perhaps something to bear in mind when it comes to system-matching. Elsewhere, the Sony’s big, open sound lends itself to the lamenting guitar lines and aching organ in the album’s eponymous finale, and there’s space and insight to keep a hand on both as each weaves around the other. There’s a delicate naturalness to Knopfler’s pensive vocals as well, which are confidently presented in the soundstage and demonstrate pleasing midrange insight. We feel confident bestowing praise on the treble, too - it’s clear and subtle, admirably balancing detail with refinement. Again, as expected, big gains in clarity and detail are made when we switch to our reference phono stage. Vocals are fleshed out and instruments are subtler and more sure-footed. Within its price-bracket, though, the Sony’s own preamp is very capable indeed. Ten months ago, when you’d have to fork out over £100 extra to secure the Sony, we’d have opted for the Audio Technica for all-round value. However, the two are now squabbling for supremacy in the same arena - there are now savings to be made on the PS-HX500. Of course, there are those who will prefer the AT-LP5’s bolder soundstage, which is an important distinction in a multi-function product. It means there's no need to be overly cautious when system-matching, and no automatic necessity to upgrade certain elements. But for all-inclusive brilliance, even ignoring its superior recording capabilities, the Sony is simply a better-rounded, more versatile turntable. These remain two comfortably five-star products, and we certainly wouldn’t hesitate to recommend either. But overall it’s the Sony PS-HX500 that just wins out.